Born in San Francisco, Nick Hyde began painting during that city’s late–1960s counterculture era—a time, he recalls, “when the possibilities were endless, boundaries were boundless.” Earning his MFA from San Francisco Art Institute, Hyde rose to the forefront of California’s Visionary Art movement, melding surrealism, psychedelia, and metaphysics into images probing spirituality and the subconscious. 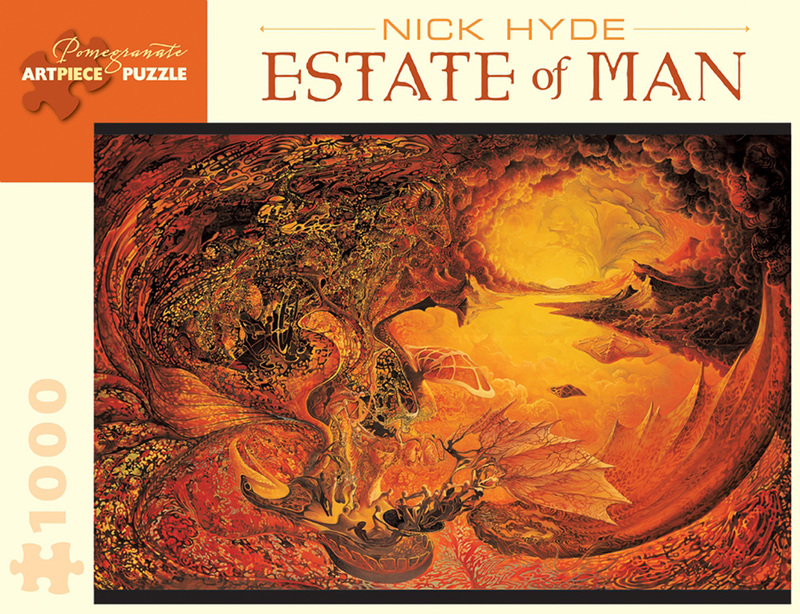 With intricate detail, Estate of Man draws the viewer into an imaginary world where elements evocative of both Genesis and Dante’s Inferno collide. Hyde’s work has been exhibited in numerous galleries and museums, including the San Francisco Palace of the Legion of Honor and the Smithsonian Institution, and has been published in magazines, on sci-fi book covers, and in the book Visions (Pomegranate, 1977).